Drafted: Selected by the Houston Rockets in the second round (34th pick overall) of 1977 NBA Draft. Larry Moffett married Anita Davis in Carcert Italy in1978 he also played basket ball for them. http://obituaries20.articdesigns.com/index.php?obID=398: "Mr. Larry Moffett, son of the late Mr. and Mrs. Albert and Bernice Carr Moffett, was born November 5, 1954 in Gary, Indiana. Larry Moffett was an American basketball player who played for Horace Mann High, Gary, Indiana. 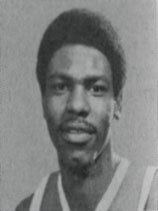 He went on to play for Murray State University, Compton Community College and the University of Nevada, Las Vegas, before being drafted by the Houston Rockets in the 1977 NBA Daft. He played in the NBA for one year, then Larry went on to play oversees basketball in France, Spain, and Belgium. After his career in basketball Larry moved back to Las Vegas, Nevada. On Friday, May 2, 2011, Larry departed this life at the Willis Knighton Medical Center in Shreveport, Louisiana. He leaves to cherish his memory: one aunt, Rosetta Smith of Opelika, AL; one uncle, Hatmon Carr of New York; four cousins, ...". Pray for you, Larry, hoping that you made It. Larry Moffett, play only one season of high school basketball at HoraceMann high om Garu.Indiana 1972-73 season. By the time he reach the Pro at Houston Rockets , that was his Fifth year of basketball. Which he was still learning the game which came to a short career with Houston Rochets because of the lack of the coach Tom Nasolke, knowledge of him to grow with the sport if given the chance to improve. That was cut short in Houston, when he was cut after a injured ankel then cut the final thirteen games.